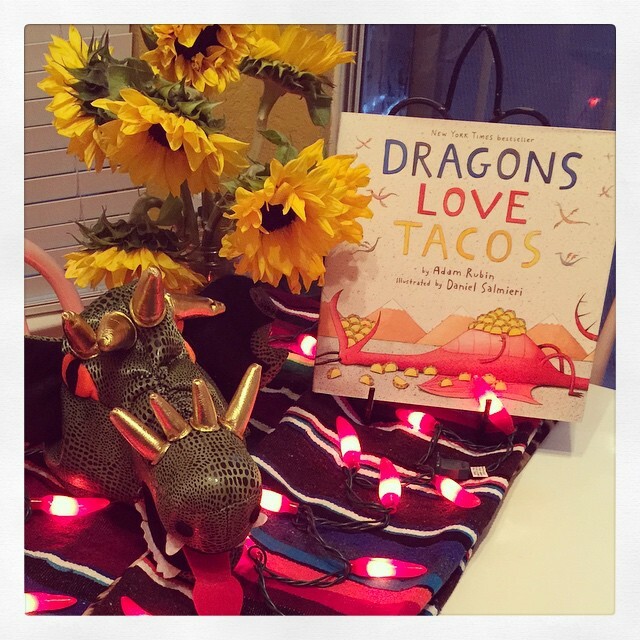 My boys LOVE the book Dragons Love Tacos and it was a natural choice for our second Family Book Club. We started the day off with breakfast tacos. I used two serape scarves that I already had, some chili pepper lights, flowers leftover from the baby shower I hosted last weekend and the dragon hat from Mason's Knight party to decorate the table. The kids FLIPPED over the lights. I found these little "Make Your Own Taco" sticker activity books for $1.26/each on Amazon and they were a fun activity to keep the natives occupies while Dave and I got breakfast going. The stickers were removable and they had a great time sticking and resticking their tacos. Dave read the story this time and, of course, he had to wear the dragon hat. Our first activity of the day was to paint the taco shells for our paper tacos we would be putting together later in the afternoon. Next time I would glue a popsicle stick to the mask instead of trying the rubber band. Lunch was leftover taco pasta, which is SUPER simple and yummy. Brown 1 lb of lean ground beef. Add in 1 cup water and 1 packet taco seasoning and let it simmer about 5 minutes (or until most of the liquid has cooked off). Add in 6 oz of cream cheese and stir until melted. Add in about a cup of shredded cheese and about 3/4 of a box of penne pasta (already cooked)... (I use 3 cups of dry pasta). Stir it all together and voila!!! After Griffin went down for a nap the boys and I did a science experiment with taco sauce and pennies. I prepped the table with "directions" and space for us to conduct the experiment. First we took a dirty penny and covered it in taco sauce. After a few minutes we scrubbed it and rinsed it off and voila! It was clean! So now to find out what made it clean... First step, we put a dirty penny next to each of the individual ingredients (salt, water, vinegar and tomato paste) and covered the pennies in each of the individual ingredients. We washed those pennies off and they were still dirty. So we concluded that it wasn't any individual ingredient that was cleaning the penny. It must be a combination! We tried three different combinations of ingredients and then waited for the results. We cleaned up science, played for a bit and then got into craft mode. Each of the boys picked out a plastic cup and we ripped strips of red and yellow crepe paper and then taped them to the inside of the cup. Next up was finishing our paper plate tacos! We shredded up some brown craft paper and then more red and yellow crepe paper. I forgot to take progress pictures, but we glued and taped the three papers down to the inside edge of the plate, then I hot glued the green crinkle on. We folded the plates in half, stapled and admired our tacos! After crafting, the boys wentand played and I cleaned up and set up our "Taco Party" for dinner. I used their crafts from the day to decorate and they were so proud to show them off. I forgot that I had ordered these dragon stickers, so after dinner I came up with a quick little activity for the boys. I put one of each of the stickers along the bottom of a piece of paper and then labeled them each with a number . Then they had to "stack" that number of matching stickers on top (creating a little graph). 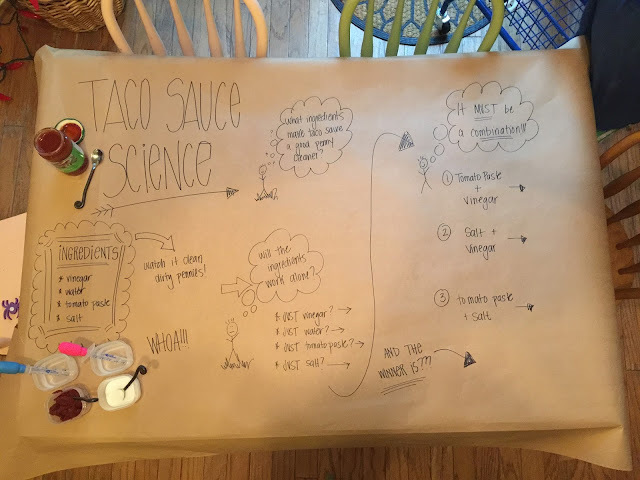 We had so much fun on Dragons Love Tacos Day and I had the best time coming up with activities for us to do together throughout the day. If the "mess" and clutter of crafting with your kids stresses you out, here's a little tip. The nigh before I go through my craft supply closet and pull out what I'm going to need for the next day. Throughout the day as we're playing and crafting I pull things from the basket and then throw it all back in there when we're done. It keeps the mess minimal and puts everything we're using at hand. If you don't have Dragons Love Tacos in your family library, you can pick it up on Amazon HERE (and it's on sale!!!). I'm hoping that you can pull an activity (or two!) from here for your own Family Book Club day. PLEASE don't hesitate to let me know if you have any questions!!! This looks like such a fun day! The ideas you come up with are so creative!! Where are your yellow, green and orange plates from? I really like them! Thanks! They're from Pier1... but from when we bought our first house... so probably 11 years ago! The line was Toscana if that helps at all! I LOVE the Family Book Club Day idea! I can't wait to try these with my kids this summer. I'm so glad! Let me know how it goes! We don't have this book! Adding it to my Amazon order right this very second! What a fun day, especially since it looks like it was rainy and crummy outside. Love the paper plate taco they made. Thanks for sharing! You did it again! Great ideas! You should seriously write a book about your family book club. I'd buy it in a heartbeat. Oh, goodness! Too sweet of you! Yet another fantabulous idea for my class. So much goodness here. I think I might need to give you credit in my newsletter. Lol. You are brilliant. So glad that you're able to use some of these ideas in the classroom! Holy cuteness batman! Seriously great job!! I'm feeling very inspired, thanks! It's obvious you are a teacher :) This family book club activity is brilliant and incorporates so much! GREAT ideas and thanks for sharing! Once again, you are amazing! Another book I can add to my " someday " shelf for grandkids! Love it! I absolutely love this! So much fun! keep the book and activities coming. I can't wait to try some of these with my 3 year old. This looks like so much fun!! I think my favorite part was the fire breathing dragons. Sure they loved that!! I'm going to officially declare you THE MOST FUN MOM EVERRRRRRRRRRRRRRRRRRRRR. In the history of EVER. Seriously impressed with your skills once again! I am a preschool teacher and love this idea. Would it be okay if I used this idea for my class next year? I could plan my entire week around this book and crafts. Such a great idea. You are most fun mom!! I love reading your blog! So creative! What a fun day! Such a cute book, and what a fun day!! Love!! Such a fun idea! How do you choose each book? So far I've picked books that we have and that my boys love. I also flip through them, brainstorm and pick ones that I have some ideas for right off the bat. This is awesome! We homeschool and do fun book studies all the time, so I love seeing new ideas!!!!! Ahhhh I am loving this so much!!! My kiddos in my classroom would love this as well! Thanks! Such cuteness for your kids. Lifetime memories for them. Keep it going!!! Love this idea!! Where did you find the mask template? I googled dragon mask and then saved it to my desktop. I'll go back and see if I can find it and I"ll post the link here. I mean, girl, how in the world??? You are the BEST mom ever! I wish I had an ounce of your energy and craftiness!!! I am more and more impressed every time you blog! Completely agree!! The energy you put into that amazes me girl! Y'all are sweet! Keep in mind that I'm not doing this many crafts every day. ANNND I enjoy doing it - so while it can be tiring, it's super fun. Love this!!! The fire breathing dragon was my fave!! This is way too creative and good job mom! Your kids are lucky!! I am LOVING these. Going to start with your two books and then do my own. AHHHH. I can't wait. YAY!!! Sounds like a great plan. Love this! I totally stole some of the elements from 'The Day the Crayons Quit' book club! We had a rainy day last weekend and it was PERFECT to keep the kids engaged and not kill each other (or me)! I will definitely be grabbing this book and gathering supplies for activities to keep us occupied on our next rainy day (probably this weekend again, thanks to tropical depression Bill). If you have a favorite list of kids books to incorporate activities with I'd love for you to share!! Ok, even though I'm older than you by a couple of years, can you be my mommy?! Because I totally want to make a fire breathing dragon! You are so creative, it is awesome and inspiring! Last weekend I bought the supplies for your 4th of July crafts and we made the hot air balloon and the flag (still in progress, the paint took so long to dry). My almost 3 year old loved it - she loves projects. Also, you are going to sell so many books, haha! I've already ordered several you've mentioned, most recently the crayons book and now today this dragon book (and the author's other book about squirrels). Thanks for the awesome ideas! Wow, you are the most creative mom in the world!!! What wonderful memories for your kids!! This is seriously off the charts amazing! I love your creativity. 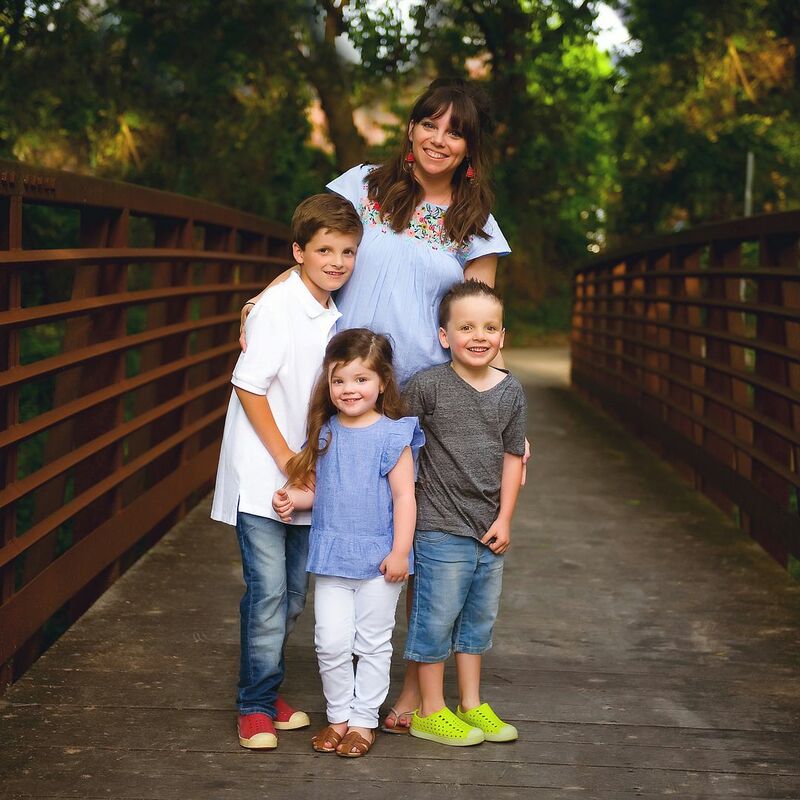 You're surely creating amazing memories for your kiddos! Such a sweet mamma. Let's talk about how cute that taco is!!! Right??? The taco is my favorite! The best part: the picture of your husband reading to your kiddos. Such an inspiring example of a hands on, loving family. Awwwwwwwwww. Thank you!!! And yes - Dave is the BEST! Such great ideas! Thank you for sharing, and thank you for the motivation and for reminding me what's truly important....the time we spend with our kids! At least they're working!!! :) hahahaha Thank you so much! So glad you enjoyed this book, I love all your activities and different taco recipes, yum!!! Wow - this totally stressed me out! I think I would feel proud to get through one of those activities in a day with my kiddos. I'm so impressed you can come up with all of this and execute it. OH and feed them in the process. Just amazing! My first graders absolutely LOVE Dragons Love Tacos!! Thanks!! You're the best! Enjoy the weekend with your kiddos and Dave!! Can we PLEASE be neighbors?!!!! I love this so much and bookmarking to hopefully do this summer with my daughter and nanny kiddos! This is perfect for my upcoming 12 hour work days!! OMG, I just need to live at your house with all of the cool stuff you do! You are so creative!!! Love all your projects! I'm not very good at the plan ahead part! i always love your family book club posts! I can do them with my own kids..and my school kids! I am loving the family book club posts! Such great ideas and I know my kids will have a blast. Keep them coming! This is the absolute best idea! My 7 year old would love it! My 10 year old hates to read but maybe if I did something like this he may love it!!! Great idea! Thank you for the inspiration!